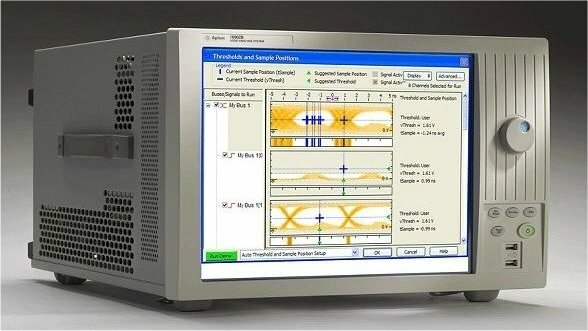 The Agilent 16902B Series logic analysis system is optimized for the tough debug problems that technicians face in today’s environment. Rugged and dependable, it was designed to deliver high speed performance combined with its renowned accuracy. It employs innovative probing technology and offers straightforward triggering capability with an intuitive user interface, enabling engineers to learn its operation quickly and intuitively. The analyzer takes advantage of multiprocessing, large memory technology, and multithreading software technology to provide the users with faster performance. The 16902B offers extremely rapid zooming and high-channel count acquisitions, and its intelligent 4GHz timing zoom technologies enable users to obtain highly accurate measurements when testing a variety high speed signals. The scalable design of the model offers room for any additions that may arise from future technology trends. A built-in touch screen display is used by the 16902B logic analyzer. It will support a maximum of four external monitors, and it’s designed to deliver content-rich outputs. One of the more impressive features is the flexibility that the system offers. It can be easily integrated into various debug environments. This design characteristic enables users to measure, analyze, and share data. Additionally, it allows for either keyboard and mouse, or touch screen use. The 16902B will also allow users to control and monitor it remotely over a suitable network. Such a set up utilizes email to notify a user when the equipment triggers. It also incorporates anti-virus software, which helps ensure security compliance. Utilizing the power of the latest multiprocessor technologies to enhance productivity, the Agilent 16902B allows users to perform remote controlled operations by hosting its applications on a Windows-based computer. The technician can run automated tests by utilizing Microsoft DCOM or ASCII remote interface. The 16902B analyzer is also an excellent choice for various debugging applications involving digital designs. It finds numerous applications in the debugging of Altera FPGA or Xilinx and surrounding system. 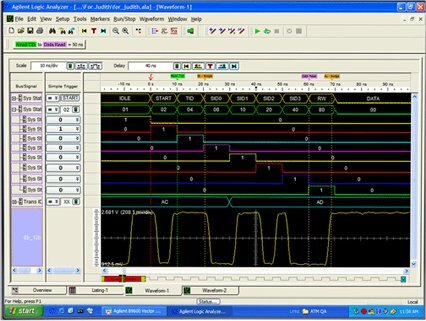 Due to the high level of integration employed in the designing of many digital circuits, the exercise of debugging them is challenging. Signals are usually measured at the edge of the FPGA. However, a dynamic probe enables users to carry out measurements from different parts of the FPGA without restrictions. A 256M deep memory is used by the analyzer, helping to quickly identify various problems. Its general-purpose knob is used for adjusting parameters when taking measurements. Overall, the scalable design of 16902B logic analyzer ensures that operators can add new features when needed in the future. This expandability feature to choose modules depending on specific needs makes the Agilent 16902B an excellent choice for the modern laboratory. This entry was posted in Site News and tagged Agilent 16902B. Bookmark the permalink.